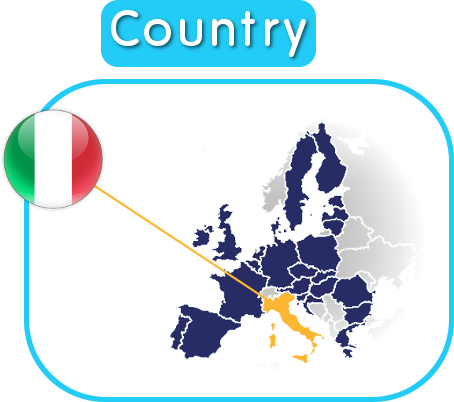 On Saturday 10 and Sunday 11 November, the third Italian Multiplier Sport Event of the MEW project, an experience of health and well-being between some of the most beautiful stops of the "San Benedetto Path", took place in Italy. 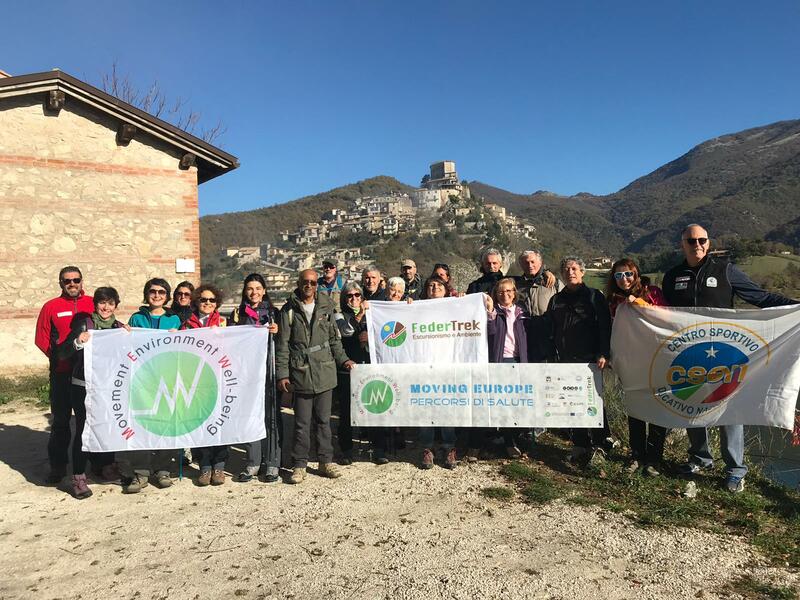 The two-days walk, organized in collaboration with FederTrek and Sentiero Verde Association, began early Saturday morning, with the departure of the bus that brought the participants from Rome to Castel di Tora, in the province of Rieti. The route of the first day, 16 km for 800 meters in altitude uphill and 600 downhill, ended in Orvinio. 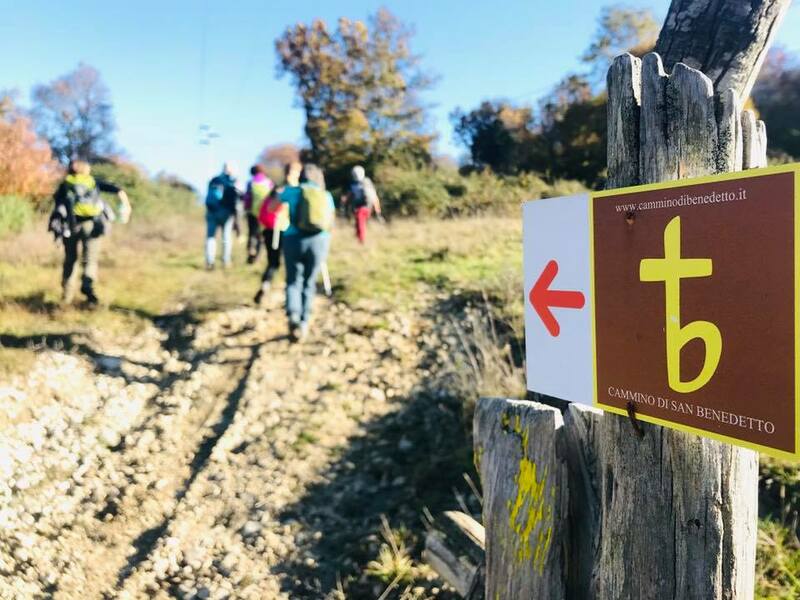 Starting from the shores of Turano Lake, where to welcome the participants was also the Association "Walking with", the excursion began in an almost magical atmosphere, thanks to the fog that was the Rocca of Monte Antuni’s background. For about 6 hours the wonderful views of Navegna and Cervia Mountain Reserve and the most beautiful peaks of the central Apennines - from the Gran Sasso to the Terminillo - framed the path, which included a stop at the women's religious institute of the charity Sisters of Pozzaglia Sabina. There, the energetic and sunny Sister Fernanda has thrilled everyone with the story of St. Augustine, protectress of the nurses of Italy. Continuing on the plains that join the town to Orvinio, the group reached the hostel of San Michele, where it found to welcome a dinner accompanied by the rhythms of Vacuna Sabina, a popular music duo from Scambriglia. The morning after the departure was at 9, to travel simpler 12 km almost always downhill in the verdant valley that runs through the park of Monti Lucretili and comes up to Licenza town. 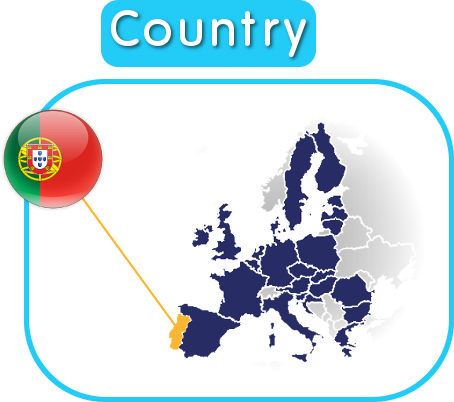 During both days the organizers accompanied physical activity with experiences of sensory perception and on-path meditation. 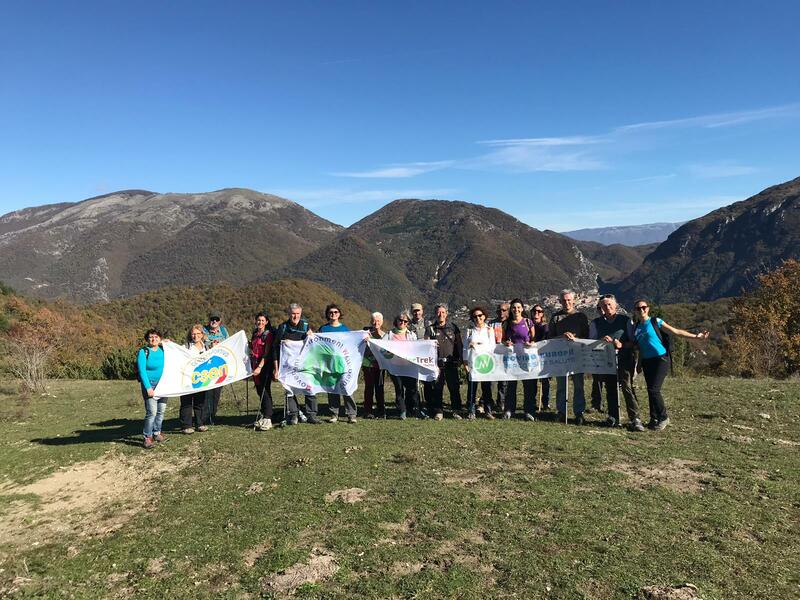 This type of activity culminated in the end of the walk, at the Garden of the Five Senses and thanks to the collaboration and patronage of the Lucretili mountains park, with a moment of sensory experience with aromatic plants led by Stefano Panzarasa and a final welcome with refreshments. In the full spirit of the MEW project to fight the sedentary lifestyle and promote a healthy and active lifestyle in which this multiplier event has also been included, the organizer of the event Francesco Senatore (Sentiero Verde Association) has considered himself fully satisfied with the results reached by the group, which after two days together almost had difficulty in say goodbye to each other and returning to reality. "I am really glad to have been able to instill to all the participants the beauty of a walk experienced in several days, made of hospitality, meetings, participation and aggregation between people who did not know each other before, thanks to the beauty of handling things slowly and at a walking pace" commented Senatore at the end of the event. The appointment with the latest Italian Multiplier Sport Event is for December 2nd in Cittaducale town, for a wonderful free day trip that wants to combine health, well-being, culture, sociability and fun.